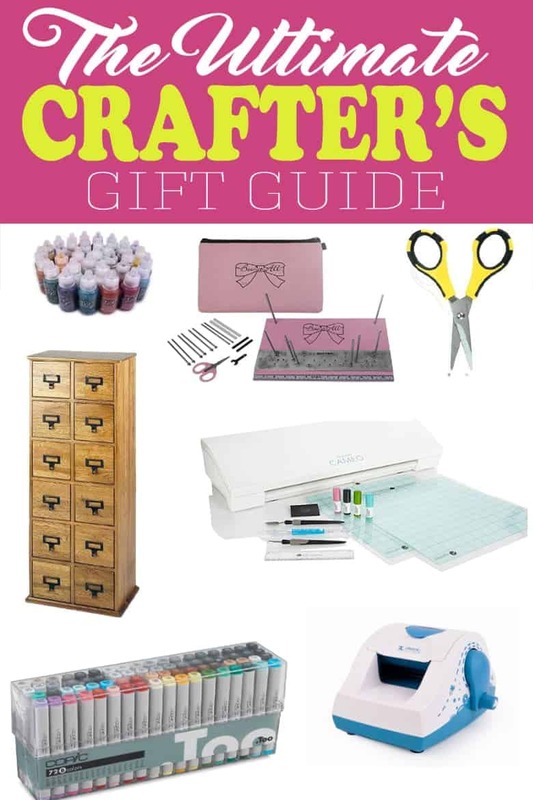 I have always needed a creative outlet and have been crafting and creating artwork for 25 years, so I know a thing or two about the best gifts for crafters. The development of top-notch crafting supplies has made some dramatic gains in the last decade. Though many may be familiar to scrapbooking queens, my favorite products are general purpose. Today, I want to share my all-time favorite crafting tools. These make great gifts for yourself and friends. This post may contain affiliate links but I am in no way affiliated with any of the companies. I just love them THAT MUCH! You can write your name in glitter! ‘Nuff said. Stickles is, essentially, glitter glue but I prefer the quality of Stickles over anything similar. Unlike loose glitter, it won’t make a mess. It also writes very fine and is easily controllable. What I really love about stickles is that you get a lot of glitter out of that fine tip. Bonus – the tip does not clog. If you love all those fancy bows on packages and decor, there is no easier way to make them than with this Bow -It-All tool. You can make so many shapes and sizes with almost any ribbon. Love it! As an avid crafter, I can tell you that you can never have enough scissors. I have come to actually hiding “the good pair” because they would go missing all the time. One thing that people often don’t realize is that different styles of scissors do different things. My favorite are these precision scissors for fine detail but they don’t work well with fabric or thread. For general use, I use these mixed media scissors. For hard materials such as thin metal, cardboard or twigs, I love these heavy duty shears. As any crafter knows, organizing your craft supplies is as important as actually crafting. But what do you do with all the small bits and bobbles? I personally use a garage organizer that I have decorated. I love a library style catalogs like this one as well, but there’s also this awesome tiered tray with compartments. If you love looking at storage ideas, check out our guide to craft room organization. The Silhouette Cameo is a cutting system that hooks to your computer. This baby is worth its weight in gold and then some. The Silhouette line can tackle a lot of mediums from etching glass to paper, fabric, or vinyl. Why is this the single best tool, ever? If only because you can take any, ANY image and your computer will cut it for you. Like photoshop, it requires some tech savviness but once you get the hang of it, your options are limitless. Yes, it is around $260-300, but after having a silhouette for about 10 years, I have probably saved at least $1000 or more. And if you don’t want to bother, they have a shop where you can purchases pre-made designs (usually $0.99-2.99). Cricut Air 2 is also a great option and I hope to write on the differences and similarities soon. The Cricut is almost identical, but you need consistent and reliable internet in order to use (as of this writing). Therefore, I would generally recommend the Silhouette Cameo, but you would be great with either one! If you have a sewer or crafter who likes to work with heavy materials (textiles, wood, etc), then the Cricut Maker is the way to go! Watch the video and be fascinated by what it can cut. Copic Markers is THE marker company. As in, I will never buy another marker again. I have used artist markers since I was a child and these are the best I have found. They are quite pricey but they are refillable. Anyways, these markers blend purrr-fectly and come in several sets to choose from. No streaky lines. They are made to be blendable so if you want to create an ombre background, you can do so with these. Google a few you tube videos and see some amazing portraits done with these babies. If you are looking for something less expensive, but still nice, I would recommend the Tombow Sets. These do not have the brush tip that the Copics do and are not refillable or tip replaceable, but they will give you the same beautiful blending that the Copics will at a fraction of the price. This little roller machine adds an adhesive backing to whatever semi-flat material you roll through it such as rhinestones, chipboard, or tiny bits of paper. I love the Xyron Sticker Maker for gems and intricate designs such as snowflakes or doilies that do not work well with other adhesives. It is also less messy than traditional wet glues. If you have a silhouette cameo already, this is amazing just for letters or title diecuts. Added bonus – if your working with a bunch of paper bits, the adhesive rolls out on sheets and keeps everything organized and together. The xyron sticker maker comes in several sizes from 1in width up to 5in width varieties. While this may seem like a niche item, I have personally found so many uses for my craft heat gun. From perfectly stamped candles to melting crayons into fun shaped molds, this gun has some really fun uses beyond embossing and drying glue. Adult coloring is having a big moment right now, and this unique book by Cindy Elsharouni includes Stress Relief Patterns, Inspirational Words, Mandalas, Animals, Butterflies, Flowers, and Motivational Quotes. It is beautifully illustrated to get your creativity going while reducing stress. These are really good for long car rides and airplane flights as well. I also like The Amazing World of Horses and if you are not offended, you might find this coloring book humorous (warning: graphic language). Who knew tape could be so versatile? And pretty! My personal favorites are this gold foil set, this stunning watercolor set, and a solid color set that every crafter needs (really!). I actually have more but those are the ones I use most often. I have heard that people collect washi tape rolls the way people used to collect stamps. Of course I use it in scrapbooking and wrapping packages the most, but I have seen everything from wedding decor to wrapping votive candles in washi tape. I even have this great Washi Tape Book filled with 110 simple crafts you can do with washi tape. It makes a great gift! This stuff rocks! Essentially, Glossy Accents adds a 3 dimensional coat of gloss to anything you put it on. Sort of like mod podge dimensional magic but comes out clear so you can easily remove any bubbles. It also does not take as long to dry as the mod podge. I have had problems with the tip clogging but I have an unlimited supply of sewing pins to fix that. This dimensional product can be used on jewelry, paper crafts, as an adhesive, and for creating your own embellishments such as beads and drops. The tip is thin so you can also use it to write or with loose glitter. I have been using Photoshop for around 10 years now. I know that it’s rep is for photography, but I cannot tell you how many hundreds of times I have used it for craft projects. I make most of my printables, word art, room designs, mood boards, artwork and designs. And for $10 a month for photoshop and lightroom, you can’t beat that! However, I will say these programs are dedicated towards professionals and are extremely versatile. With that comes a lack of user friendliness. However, my 65 year old father has even begun learning Photoshop, so it’s possible, and their are tons and tons of great videos to walk you through whatever you want to do. If you want to take it to the next level, there is an Illustrator package as well which is the premier digital drawing application. Once again, not geared towards beginners, but it rocks in versatility! Hope you learned some new tools that you could use in new and creative adventures. It has inspired me to get some of my favorite craft supplies out and make some stuff! Hey, some of my best crafts were floor crafts! Whatever works, I say. And I love your favorite tools too! I actually think I have all of them. 🙂 Thanks for linking up with Creative Spark!! I have been thinking about getting a Xryon I need to learn a little more about it before I take the plunge. Thanks so much for stopping by the Creative Spark Link Party hope you stop by again next Wednesday. Great Supplies. The last two are on my wish list. I so want a Silhouette and I never knew you could use Xyron to put sticky backings on rhinestones. Thanks for sharing your list on Merry Monday. That is one of the things I love about it. I used to do the whole tweezers and wet glue for gems and rhinestones. Such a PAIN! I have always wanted a silhouette!! They look fantastic! Fun post!